6.5" Two way in wall design. The tweeter swivels to angle the high frequencies to the main listening area. The 6.5" Polygraphite woofers fills any room with clean, crisp bass. Perfect for surround sound systems or listening to music throughout your home. Great sound at a great price. 5 year Warranty! 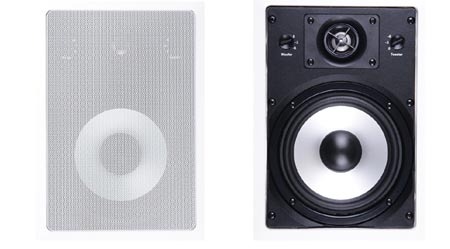 2 Way 6.5" In Wall Speakers. Cut Out Size: 10.94" x 7.52"